“Happy Epiphany!” “Have a joyous Epiphany!” “Wishing you a blessed Epiphany” I’m guessing you’ve neither given nor received any such greetings this holiday season. It’s entirely possible you have no idea that January 6th is Epiphany. It’s also possible that you may not even know what Epiphany is, or why I’d be writing a blog post on it…. Epiphany is traditionally observed 12 days after Christmas to commemorate the arrival of the Magi to adore the Christ child. Now, the Bible provides scant details on their visit, but Christians throughout history have added in their own details, celebrations and observations. In our home, about the only celebration we do for Epiphany is that we un-decorate from Christmas. Not actually on January 6th, but the closest Saturday to it. I like to run the Christmas season all the way through until then. So clearly, it’s not my grand observance of this event that spurs my blogging. No, it’s actually a painting (convenient for an art related blog…) that spurs me to write this time. When I was in college, I was required to take an art appreciation class. I had never considered myself much of an appreciator of art, so I was more than bit intimidated. I remember having to choose a painting and write a paper about it, specifically about what the artist might be trying to convey through their work. 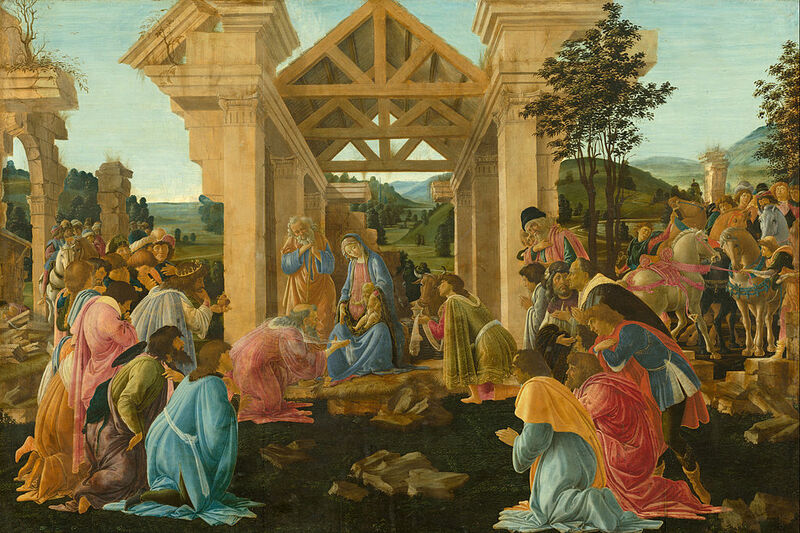 For reasons I do not remember I chose this painting by Sandro Botticelli. 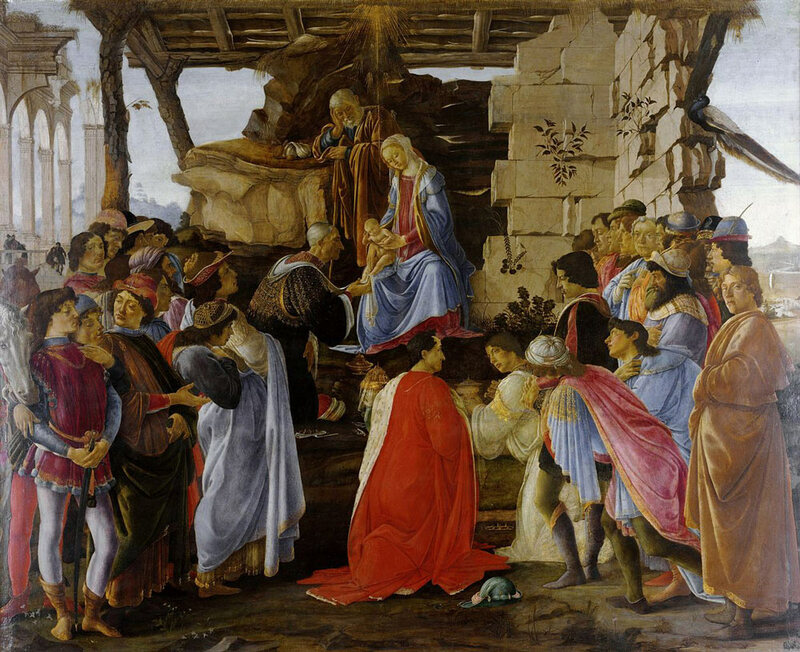 As I began studying the painting, called the Adoration of the Magi, I discovered that Botticelli had painted several different Adorations and as I studied them, I saw some interesting differences. The older paintings of the Magi seemed more formal, the Christ child more distant. The newer paintings were much more intimate. Seriously doubting myself, I timidly wrote a paper positing that Botticelli had undergone some type of spiritual journey as he painted. I was pleasantly surprised when my professor returned my paper and validated my conclusions. For the first time, I felt like I “got” an artist – that I could look at someone’s art and really understand what was going on in the work; it was more than just “oh, that’s a nice painting.” In a way, it was my own personal “epiphany”. Now, I’m not writing to encourage you to go take an art appreciation class, or hang a Botticellli print on your wall – though both of those would enrich your life, I’m sure. It’s the beginning of a new year, the time for reflecting on the year that is ending and making resolutions for the new year. What are those things that intimidate you? Are there topics/subjects that seem beyond your comprehension? Is there a skill that continually eludes you? Why not make this year the year to conquer those fears? What step can you take this week to climb that mountain? Share in the comments and we can all encourage each other!